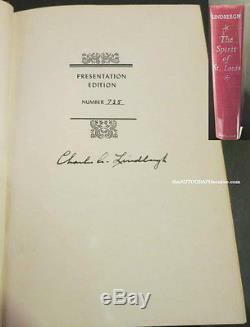 Charles Lindbergh Signed Spirit Of St. An original first edition "Presentation Edition" of Lindbergh's 1953 Spirit of St. Louis book, autographed in black ink on the second inside page by Charles Lindbergh. The book is number 735 from a numbered limited edition of 1000 books. Find out who you are purchasing from. If it is too good to be true... Chances are it is fake. Don't take a risk when investing. Don't treat your memorabilia investment any differently. Rock'n'Roll and Hollywood memorabilia is VERY hard to come by. Someone with the wherewithal to authenticate a piece knows what it is worth. There is not a respected dealer in the business who has multiples of these types of pieces. Real dealers have long waiting lists on the high end pieces... They won't be sitting on big inventories. Search for information about them on Google and draw your own conclusion..
Use your brain, educate yourself, and enjoy collecting! - The Autograph Source Aspen. The Autograph Source specializes in unique, History, Hollywood, Sports, and Rock'n'Roll pieces. Our goal is to provide you with an investment-grade collectible that will be an incredible conversation piece in the short term, and appreciate in the long term. We have provided customers all over the world with some of the finest pieces the industry has to offer. Look under authenticity for more information. Due to the unique nature of our business, sometimes it can take us months to authenticate and negotiate for a piece. By the time we receive the piece, there can be several parties interested in purchasing it. As a result, a high percentage of our pieces sell in the first 48 hours. Our founder has been involved at the highest level of this field, as the managing partner of a high-end memorabilia gallery here in Aspen since 1996. He has been collecting for most of his life, and has found a way to live and breathe his passion for RocknRoll, Sports, Hollywood, and History each and every day. Feel free to contact any of our staff at any time. The Autograph Source works with the certified experts in each field that we sell in order to make insure that every piece we sell is authentic. Rather than using a generalized authentication service, we rely on the opinion of the specific expert; the most knowledgeable authority on each particular piece. Through our years in the industry, we know who the experts are, and they are used to dealing with us. We do not take any risks on the pieces that we sell. The provenance of each piece is the most important thing. If the provenance is impeccable, then we move on to authentication of the piece or signature. If any part of the equation does not add up, we simply do not deal with the piece. We offer a Certificate Of Authenticity, which is a lifetime guarantee that the piece is real, with every piece. A Certificate Of Authenticity is only as good as the company that issues it. Our reputation is impeccable, and our letter means something. Different items are sourced in different ways, and we are always happy to discuss this topic. It is the most important facet of our business. The item "Charles Lindberg Signed Spirit Of St. Louis Book First Presentation Edition BAS" is in sale since Monday, September 26, 2016. This item is in the category "Collectibles\Autographs\Historical". The seller is "theautographsource" and is located in Aspen, Colorado. This item can be shipped to United States, United Kingdom, Denmark, Romania, Slovakia, Bulgaria, Czech republic, Finland, Hungary, Latvia, Lithuania, Malta, Estonia, Australia, Greece, Portugal, Cyprus, Slovenia, Japan, Sweden, South Korea, Indonesia, South africa, Thailand, Belgium, France, Hong Kong, Ireland, Netherlands, Poland, Spain, Italy, Germany, Austria, Israel, Mexico, New Zealand, Singapore, Switzerland, Norway, Saudi arabia, Ukraine, United arab emirates, Qatar, Bahrain, Croatia, Malaysia, Brazil, Panama, Jamaica, Barbados, Bangladesh, Bermuda, Brunei darussalam, Bolivia, Ecuador, Egypt, French guiana, Guernsey, Gibraltar, Guadeloupe, Iceland, Jersey, Jordan, Cambodia, Cayman islands, Liechtenstein, Sri lanka, Luxembourg, Monaco, Macao, Martinique, Maldives, Nicaragua, Oman, Peru, Pakistan, Paraguay, Reunion.